Communication is both a science and a fine art. Here to help you better understand its mechanics is Matt Abrahams, a passionate and innovative coach. Communication has to be at the foundation of our leadership toolbox if we aim really high. 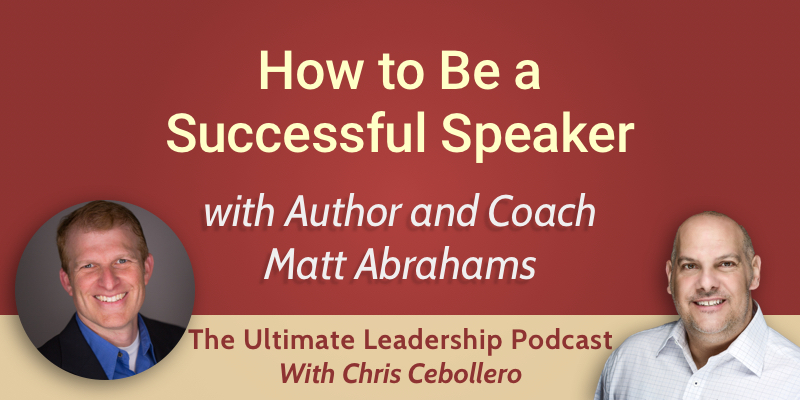 Matt teaches leaders how to be comfortable with themselves when it comes to their communication. Many people don’t feel comfortable doing presentations or speaking up in meetings, but that can be changed. Many people also feel that when they are communicating they are performing, that they have to do it right. In fact, there is no right way to communicate. There are certainly better or worse ways, but if you put the pressure on yourself to do it right, you’re actually undermining your ability to do it at all. We tend to see speaking in front of others in high-stake situations as threatening. It’s a threat to our potential future. For instance, entrepreneurs are afraid that they will not receive funding or support. A lot of our anxiety around speaking is the threat that we feel from the potential negative future outcome. Many people, because of their perceived inability to communicate effectively, feel that they are not as worthy or as valuable as other people, even when they have fantastic ideas. I have interesting and valuable information to share. It’s not about what I want to share, it’s about what others need to get. The audience-centric approach focuses on the needs of the people you’re communicating with and it can really help you get out of your negative space. Information – what do I want my audience to know? Emotions – how do I want them to feel? Action – what do I want them to do when I’m done? Take the time between now and when you’re presenting and divide it in half. The first half is preparation time, the second half is practice time. Many of us when we present, we blush or we perspire because we’re nervous. It’s an automatic result of our blood pressure going up. We can reduce the sweating and blushing by simply holding something cold in the palms of our hands. There are lots of sources of anxiety. One is feeling evaluated. If we could do something to distract our audience’s attention, then we can feel better. For example, if we start a meeting by taking a poll or showing a video, we can take the attention away from ourselves and we can put it on whatever that activity is. In doing so, we also get to engage our audience. Many of us procrastinate because we don’t like feeling anxious. It’s easier to just put things off. In reality, it just makes them worse. If you want to fight procrastination, first, create a plan and stick to it. Second, publicly commit to that plan. Also, give yourself a reward every once in a while if you’re sticking to the plan. So how do you know if your message was successful? Ask yourself “Did I accomplish my goal?” Having a goal-driven approach provides you with a way to assess success. After the communication, you also need to reflect on what worked and what didn’t. Structure is very important. Any effective communication needs to be structured. Matt’s personal favorite structure is the “What? – So what? – Now what?” structure. In this structure, you define what it is you’re talking about, then you provide the reason why your communication is important, and finally you talk about the next step, the approach you want people to take.